I love love love cherry season! 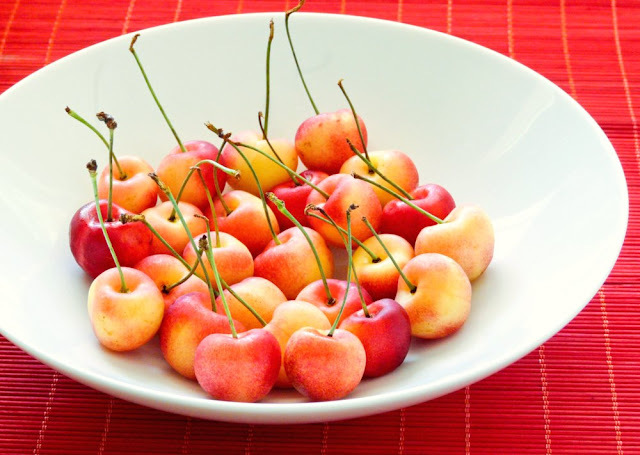 Rainier cherries are my favorite because in addition to tasting good, they are also gorgeous to look at with their hues of yellows, orange and red. The Costco where I shop at were selling 3 lb. 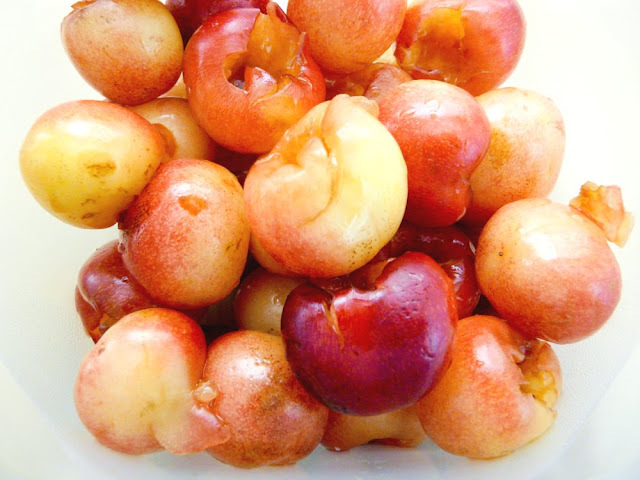 boxes of Rainier cherries for about $8 (a steal!) so of course I had to get some. 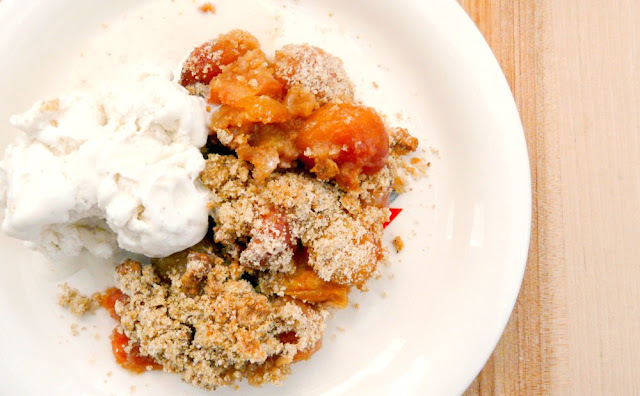 While I've enjoyed handfuls of them as a quick snack or for dessert over the last week, I wanted to try them in a crumble. 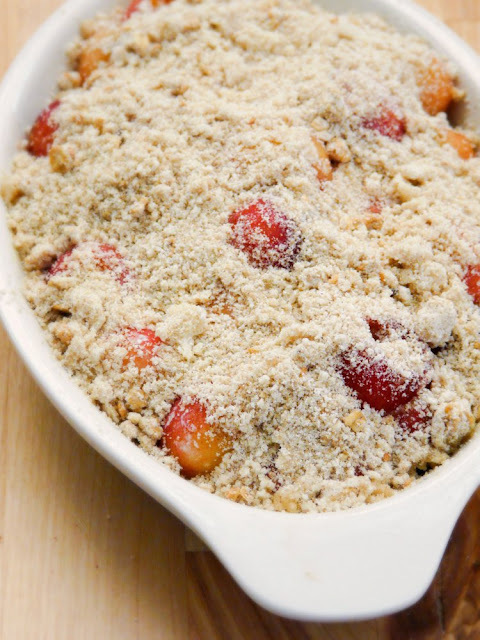 This Rainier cherry crumble is so easy and quick to assemble especially for a weeknight dessert. It's delicious on its own but to take it up a notch, serve it with a scoop of vanilla ice cream. 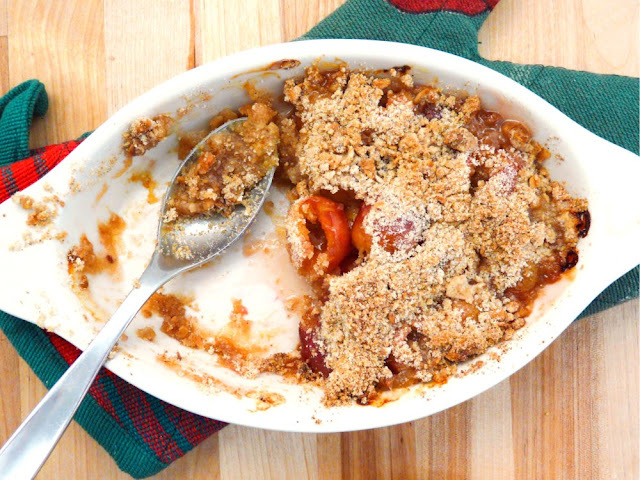 This recipe makes two regular servings or one large one, perfect for cherry lovers like me. Adapted from Cooking Light. Serves 2. If you don't have a cherry pitter, you can smash them with the flat side of a cleaver like you do with garlic, then pull the stem and seed out. You can also use the paper clip technique. I used the sharp tip of my vegetable peeler to loosen the flesh around the pit before pulling on the stem to yank it out. 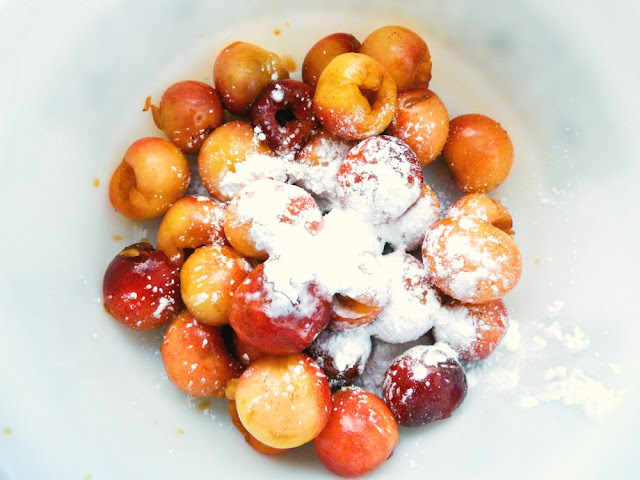 Add the cornstarch, lemon juice and pinch of salt to the cherries. Toss to coat then set aside. 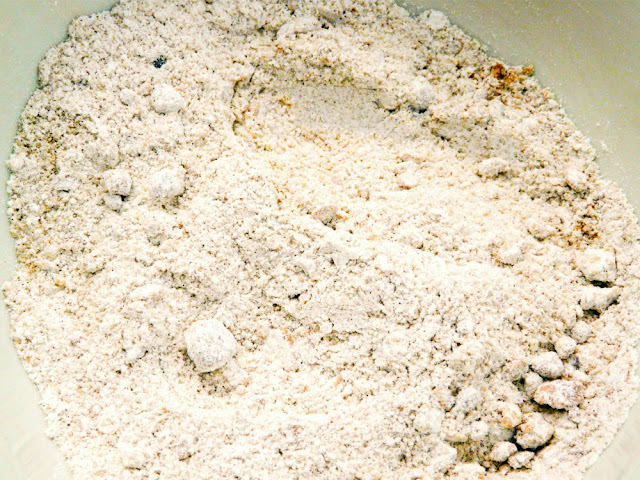 In a separate bowl, combine the flour, brown sugar, granola, cinnamon, nutmeg and salt. 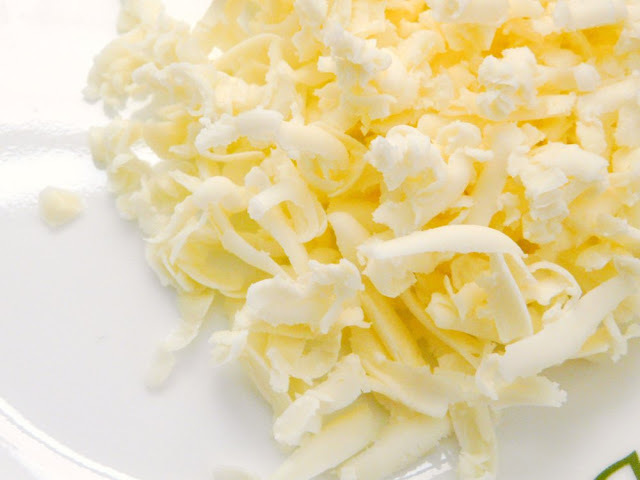 If you have a grater with large holes, use it to grate the chilled butter. Or you can cut the butter into small cubes. 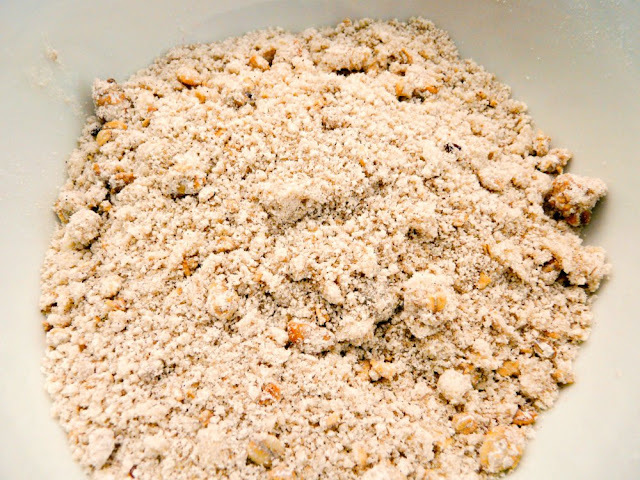 Add the butter to the dry ingredients and mix well together until they resemble coarse meal. 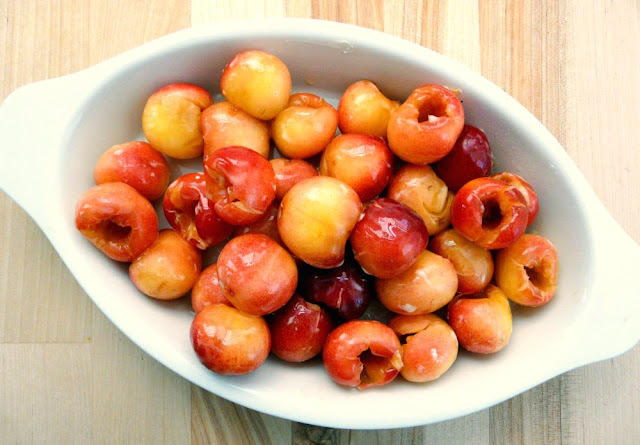 Spray the bottom of a small baking dish with cooking spray then place the cherries in it. at 400 degrees for 30 minutes until bubbly and the topping is golden brown. a little crunch from the sweet topping = yummy!